I am an unashamed fair weather cyclist. Though I love my bike (which is a hybrid, not a superfast road bike) I’m not one of those enthusiasts who cycle in all weathers, and I suffer terribly from gradientitis – any suggestion of a hill then forget it. 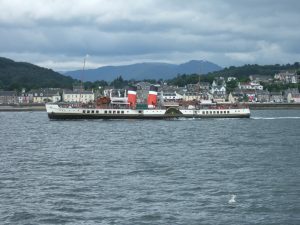 So this delightful flat out-and-back cycle to Blairmore via the Holy Loch is perfect for me, a good length (just under twenty miles), with lots of maritime historical interest and some lovely personal memories too. If you follow me on Twitter, you’ll have noticed that in almost every one of my ‘good morning from Argyll’ posts, there’s a ferry in the picture, ploughing back and forth between the Cowal peninsula and the ‘mainland’, where the big smoke of Glasgow is a mere thirty miles away (compared to 80 miles if you go all the way around by road). 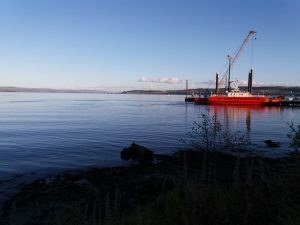 The crossing here across the Clyde Estuary is narrow, so it’s been a popular ferry route for hundreds of years, connecting the western highlands with the commercial hub of Glasgow. 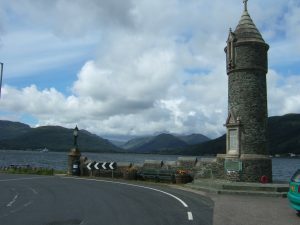 Many of the original ferry routes in the area were gifted by the Argyll family, the main landowners, head of Clan Campbell and arch enemies of the other local clan, the Lamonts. Mind you, such gifts came at a price: in 1685 the first Marquis of Argyll granted the right to Campbell of Ballochyle to run a ferry from the Holy Loch on condition that the Chieftan’s own boat, a massive craft with eight oars, had first claim on his services. Setting out on my bike, the first pier I pass is at Hunter’s Quay, about 500 metres from my home. Back in 1820, James Hunter (hence the name check) decided to build this to make the journey to his holiday home less onerous – basically, the new pier meant that the paddle steamer could drop the Glasgow business magnate off practically at his front door. Hunter’s pier remained in operation right through both World Wars, becoming less popular in the 1950s. 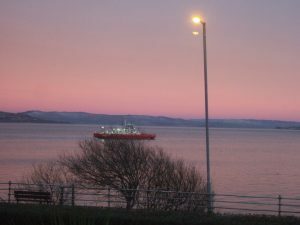 Then in 1969, along came the Western Ferries (those red ones that feature in most of my Twitter posts) and they’ve been there ever since, providing a regular and vital vehicle and passenger service. They have a well-earned reputation of running in all but the very worst of weather. A little bit further along on my cycle route, you pass by Hunter’s house, now known, as Hafton, a gothic-style castle complete with turrets, battlements and a massive portico. 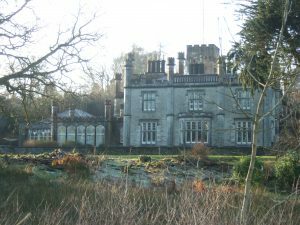 This estate was originally owned by the Campbells of Ballochyle, who, courtesy of the Argylls, also owned the right to operate the original ferry from Hunter’s Quay. The Campbells rented their land to two Lamont brothers, and then (predictably) evicted them after a dispute in 1802. Fourteen years later, along came James Hunter, who bought the estate which included the house, then called Orchard Park, and employed architect David Hamilton to convert it into a stately pile worthy of his elevated position in the world. The estate is now a huge holiday village, but back in the day, when it was owned by two reclusive sisters, it was used by the local Scouts and Guides for camping. As a Kelpie in the Brownies, I went to my first and only sausage sizzle there. Cue midgies, smoke, wet grass, and sausage burnt on the outside and raw in the middle. Cue also my misery at having to eat it. It was the worst fun I had until I went camping with my family ten years later. The site of the next pier on my cycle route is at Lazaretto Point. 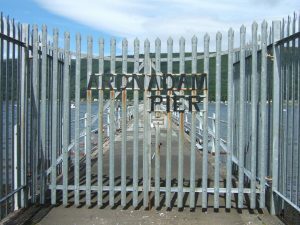 In 1807, during the Napoleonic wars, a quarantine station was built at nearby Ardnadam to provide a holding point for ships heading up the Clyde with cargo which was deemed possibly infectious. The complex was never actually used, but the name, Lazaretto Point (from the old word lazar meaning leper) remains, as does the Customs House, near one of the many Ferry Roads which dot the area. 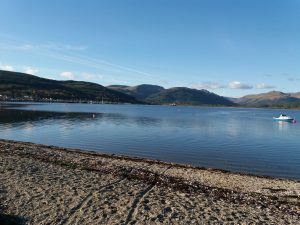 More than one hundred years later, the US Polaris submarine base was established on the same site, and the long pier stretching out into the Holy Loch now called Ardnadam was built. For thirty years, from 1961 to 1992, there was a huge ship and dry dock taking up most of this loch, and when I was growing up, the area was a huge complex of American housing, commissaries and leisure facilities much envied by us local weans. Getting into the roller-skating rink, courtesy of an American class-mate, was THE Friday night dream gig. Back to my cycle, next up is Sandbank. The piers here were built to service the gunpowder factories in Kames, near Tighnabruaich (pronounced Tie-na-broo-ach), during the Crimean war. Small ferries shuttled from the little wooden jetties loaded down with their highly explosive cargo, out into the bay where the larger sea-going ships waited. Explosions were common place. Today, the pier is used by the boats which transport felled logs from the forested hillsides to the wood mill at Troon, and there’s a marina too, which is now big enough to be a stopping off point for some of the smaller cruise ships which come to the Clyde in the summer. Round the head of the Holy Loch and over to the other side of this lovely (flat!) cycle, you come to Kilmun Church (which I’ve blogged about in more detail here) and the next pier. The engineer David Napier, whose Loch Eck tours inspired my hero Ainsley in Strangers at the Altar, built a pier on the Holy Loch in the 1830s. He pioneered what I suppose we’d call all-inclusive holidays, for he included bed and board in his prices, taking tourists from Gourock by steamer, then on from Kilmun around Loch Eck pulled by a steam locomotive, though he quickly had to replace this innovation with a horse and cart because of the primitive state of the roads meant the steam engine was forever getting stuck. 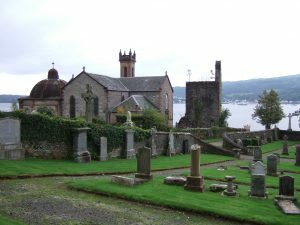 A small ferry also ran between Kilmun and Ardnadam pier until the middle of the Twentieth century, and Kilmun pier was also the last dropping off point for the Earls and Dukes of Argyll who are interred in Kilmun church. Nowadays, the pier is used as for overnight berthing by Western Ferries. Strone Pier, built in 1847, is another constructed to serve a rich merchant family, this time the Coats of Paisley, and had a fairly short-lived life. When my grandparents lived in Strone, my brother and I used to fish off this pier using those old wooden hand lines. I don’t recall that we ever caught anything, which is just as well, because I’m terrified of live fish – even though I’m happy to eat all varieties. Slightly further along on the shore is the remnants of yet another pier which I have a vague memory of hosting a lifeboat, though I’m not convinced I’m right about this – and I’d love to know more if anyone can help me. And finally, nine miles after starting out, is Blairmore Pier. 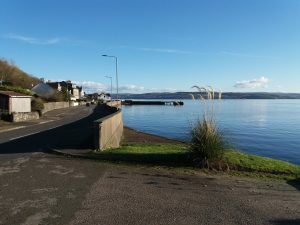 This is a lovely spot with a convenient set of benches looking right out over to Kilcreggan, north to the start of the Highlands, and over the estuary to Gourock, right up to Greenock. Built in 1855, this is another pier built for pleasure steamers that fell into disrepair, and would have fallen into the sea had it not been for the Friends of Blairmore Trust, who have restored it and opened a little museum of memorabilia on the pier itself. This is the place where I stop, read my book, drink my coffee and, if I’m lucky, have some plot inspiration, before heading home. I hope you’ve enjoyed experiencing the trip with me. I am looking forward to the first calm day of spring to do it again. 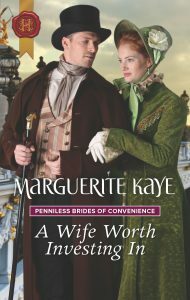 This entry was posted in Argyll, History and Research and tagged Cycles, Strangers at the Altar, Unwed and Unrepentant. Bookmark the permalink. Well that was a nice trip down memory lane, although I think I would be tempted to follow the path more travelled and head out past the old Rashfield School; where a fellow school mate has made a business carving amazing wooden sculptures using a chainsaw. Then round the bend to Puck’s Glen which is a favoured haunt of Freya and I. Do you know why it is Puck’s glen, is it perchance a nod to the bard and a incantation of the fairy glens that include’s Glen Morag in its grimoire? And finally on past my mother’s favourite house, set back off the road and nesselled in a sea of Rhododendrons to Benmore Botanical Garden. An out-post of the Royal Edinburgh Botanical gardens and home to the most amazing collection of Magnolias and Rhododendrons; which at this time of year are just beginning to bloom into a riot of colours and scents. 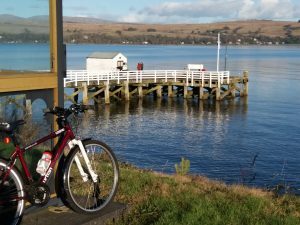 It is also home to a fab tearoom that does Rolls and Lorne Sausage (made by the “wee butcher” which you cycled past at the head of Holy Loch), that are a hearty and colourant free way to sait your hunger after the exertions of your cycle. Afterwards you can wander through the gardens to Younger’s house and if you’re lucky catch a glimpse of the Gray Lady that rides from there to Halfton and that our family has a history with (ask me later coz and cross my palm with silver, as I bet it will be a good starting point for another of your excellent novels). I’ve not taken my bike on that road, but done variations of the walk loads of times and you’re right, it’s gorgeous. There is a brilliant walk from Kilmun Arboretum that goes through Puck’s Glen, and another that starts at the Botanic Gardens and circles Glen Massan. Another favourite cycle (you’ve got me thinking about lots more posts now) is to turn off onto the Glen Massan road and then you can take the forest path along the river into the Botanic Gardens too. I love that as an evening cycle, though the midgies can get vicious. And please tell me about the Grey Lady, I’m currently writing about a ghost!